Mid-August, H. and I bought a small 5th-wheeler camper trailer, 21 years old, decent condition for its age, decent price for its condition, etc. etc. We hauled it home and while I washed the interior and began to scheme the things I’d need to stock it, H. (who’s as handy as he’s handsome) pressure-washed the outside and began to go through the plumbing and wiring and so on to bring everything into good working order. We hadn’t even camped with it yet, and there we were, the first days of owning our “Winnie” (which is the name that’s stuck), and realizing we were having a great deal of fun with it. All that up and down into its compact interior, cleaning and moving about its tiny “main room” with table, fridge, stove, and sink, its little “bathroom” with shower, toilet, sink, and closet on one end, and its “bedroom” — a mattress on the raised platform part of it, under a low ceiling and behind a curtain for privacy — on the other. 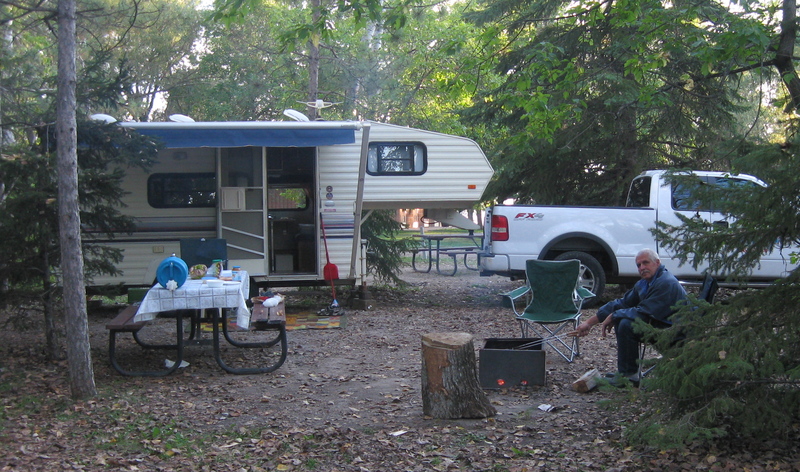 There’s not much camping season left this year – this is really an investment for next season – but we did take three nights at lovely Otter Falls a week ago and, hopefully, will have another few days away if the nice weather holds. We used to camp with our kids, in a tent, and have wonderful memories of that, but somehow in the years since they’d left home, we’d lost our enthusiasm for sleeping “on the ground,” and behind damp canvas when it’s raining. But now we were back at it and it got me wondering about camping’s appeal. It’s about Nature, that seems obvious, allowing us to intersect with a landscape and elements differently than one generally does in the city, the boundaries between us and the natural environment thinner, more porous somehow, as we move between it and our shelter, and also spend much of the day outside. And the pleasure of fire, of course, watching and tending and cooking over it. And the reading and talking one does when together away from home. 188…Bed Alcove Bedrooms make no sense. Therefore: Don’t put …beds in empty rooms called bedrooms, but instead put individual bed alcoves off rooms with other nonsleeping functions, so the bed itself becomes a tiny private haven. 203…Child Caves Children love to be in tiny, cave-like places. Therefore: Wherever children play…make small “caves” for them. Sleeping in an alcove. Playing house in small spaces. Yes, that’s it! I could expound at greater length, but suffice it to say, camping with Winnie allows me to indulge my inner Dutch — and my inner child! This entry was posted in Personal and tagged 5th wheel trailer, A Pattern Language, bed alcoves, camping, Christopher Alexander, small spaces by doradueck. Bookmark the permalink. I love A Pattern Language, and it is so neat to be reminded of this special old book, which I learned about in The Whole Earth Catalog many years ago. It is indeed wise. Somewhere around here is my copy . . . Your camping experience is truly appealing. 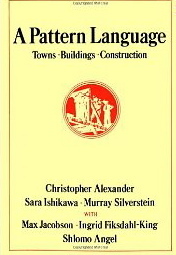 And, “A Pattern Language” sounds like a “must read”. Thanks for sharing your thoughts and photos! Sounds like fun! We haven’t attempted it yet, but we did visit camping friends this summer, and it’s true what you say about the beauty of just being out in nature all day, talking and laughing around the fire. Good times! How absolutely FUN! I cannot seem myself ever tiring of camping, either ~ there’s just something so real and exotic about it – yes, even in a 21-yr old 5th wheel at Otter Falls. It’s perfect. Thanks so much, all of you — @ Richard, Eunice, Elfrieda, Kelly, Minori — for your comments and affirmation! Are we all just part of a huge mass consciousness? Have I ever had an original thought? I ask these questions because my husband and I are currently looking at trailers too. We had a VW Westfalia for years but that old fold-down bed was a bit tough after awhile. And like you, I’m liking the idea of being off the ground and in a little more dry comfort. I love the sound of that book. I’m ordering it right away. Thanks! I know, happens to me all the time, from your site and others, snatches of thought that I just had too, didn’t I? — I have the feeling you’ll love the book, Colleen, but in any case, let us know! And it’s not something one reads from the beginning, it’s a dip-in-anywhere book. When we bought it as a gift for our daughter, years ago, when she was studying architectural technology, it was in the $80 range; thankfully is available now for about half that! A Pattern Language sounds like a wonderful book. One of my friends turned a closet into a grandchild’s dream house with special books and toys and hiding nooks. And I got to see my grandson delight in having an afghan tossed over him — a cave with holes in it to keep a little one from being scared. My daughter and her husband are spending two months on the road with camping equipment in back of their vehicle. I’ll send this post to them to let them know they can hang on to their dream even when they are grandparents. Why do you call your inner child Dutch? Did you grow up in Holland? I remember too, Shirley, how kids loved playing in the large boxes that appliances came in; endless hours of fun. Yes, the Dutch part… I should have explained. I’ve always had a yen to have one of those Dutch beds, built into the wall, behind a curtain. Here I’m “blaming” it on the fact that my Mennonite forebears were probably Dutch. My family traces back through Russia to Prussia (today’s Poland); the majority of the Mennonites who moved there came from the Low Countries, though there were also those from Swiss and Germanic areas who settled there. It was controversial when Mennonites who wanted to emigrate from Soviet Russia later began to claim Dutch heritage, as they’d been rather Germanized by then — controversial because it was suddenly strategic to be the one rather than the other — but is, in fact, reasonably accurate I think. As far as even “deeper ancestry,” well I find the DNA stuff amazing. Wasn’t it you who said yours traces back to the Celts, or am I thinking of someone else? Yes, I do have my Hershey family DNA results, thanks to my brother’s cooperation. Here is 100,000 years of the family migrations in a nutshell: East Africa-Arabia-Iran-India-Central Asia-Iran-Caucasus Mountains-Turkey-Balkans-Eastern Europe-Alpine Europe-Continental Celts-Gallo Roman Culture-Benedictine Catholic-Zurichian Swiss-Anabaptist-Mennonite. The Helvetti,a Celtic Tribe in Switzerland, were conquered by Caesar and became Gallo-Roman during the time of Christ on earth. Many Celts fled to the British Isles during this time, Which is why my Hershey DNA compares closely with the Thomas Maxwell family of Chester County, PA.
All I can say is Wow! Fascinating. What fun! Something similar is brewing in my future. (‘cept I’m considering a used sailboat. They have the cutest interiors.) Shall see. I have to catch up with the rest of your posts – am falling (like the season) behind. Dora, I’ve a lot of time to imagine my future while I do my daily walk. Too much time, no doubt. Thanks for sharing about your sister reading my book. I’m looking forward to your launch next week and to reading more of your work! 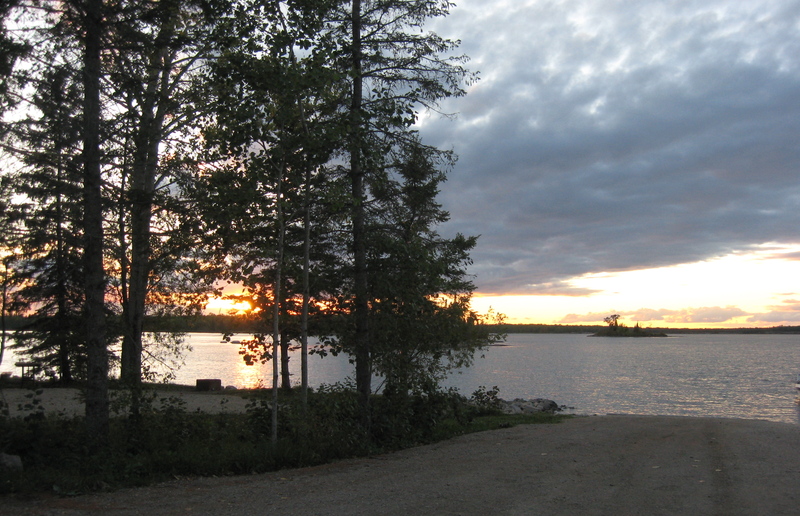 I hope you enjoy Neepawa – my in-laws used to live in an old-fashioned house a lot like Lawrence’s. It’s a great town. Your mention of A Pattern Language caught my eye because the speaker at St. Margaret’s Slater-Maguire lectures this year, Nikos Salinagaros, mentioned it in his talk (in fact, I’m sure he also said that he had helped edit a major work by Christopher Alexander). He was speaking about architectural design on a human scale, contrasting it with “inhuman” design. Human scale, that’s it exactly, Joanne; profoundly human. Thanks for this; I look forward to finding out more about the lectures.